GATE 2018 Result: This time a day before schedule date IIT Guwahati has announced the GATE 2018 Result. Candidates who had participated in GATE Feb Exam can now check their GATE Results on the GATE Online Application Website (GOAPS). With the help of this page, aspirants can check GATE Merit List for Feb exam and thus they will get to know All India Rank (AIR) in GATE 2018. To check the GATE Exam Result 2018, candidates need to enter the enrollment ID and password at the GATE 2018 Result Login. The main motive to conduct the GATE 2018 is to provide admission in post graduated courses like M.E., M.Tech, and direct Ph.D. in Indian Institute of higher education. After declaration of GATE Results 2018, shortlisted candidates will go for the GATE counselling. To check the GATE Result 2018, candidates need to go through the below section of this page which is created by team of www.privatejobshub.in. To check the GOAPS GATE Exam Results 2018, aspirants need to follow the given steps on this page, just have a look..!! First of all you have to visit the official website of the Institute which is gate.iitg.ac.in to download the GATE 2018 Exam Result. After that you need to press “GATE 2018 results are announced. Candidates can view the same through GATE Online Application Processing System (GOAPS)” link that is available in mid section of home page. By pressing on appropriate link, you will navigate to new page which will look like below image. 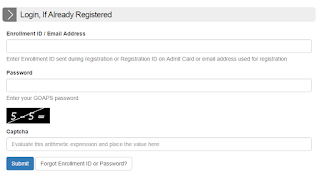 Now, aspirants need to enter Enrollment ID / Email Address, Password and Captcha in the space provided. Once all details are filled hit “Submit” tab. In few seconds your GATE 2018 Result for feb exam will appear. Contenders can go through it and check their performance. At last you can take the hard copy of GATE 2018 Results and keep it secured for future use. Candidates can check the GATE Cut Off and Qualifying Marks of previous year, please have a look…!! IIT Guwahati is ready to publish GATE 2018 Scorecard on 20-03-2018, so appeared candidates can check their GATE Exam Score card before the last date 31-05-2018. The GATE score is generally used to provide admission in Master of Engineering, Technology and PhD programmes (M.Tech/Ph.D.) in the Indian Institute of Science, IIT and other higher educational institutes in India. Many PSU’s recruitment also conducted on the basis of GATE result. Date on which the scorecard has been issued to the candidate. The Result of GATE 2018 is valid for 03 years from the date of announcements of the result. After the declaration of the GATE 2018 scorecard, candidates can be able to check their GATE Exam Marks. Scorecard of the GATE will upload on the official website of the Institute which is gate.iitg.ac.in. 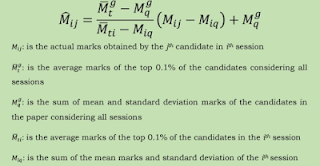 aspirants can check the GATE Results by going through the given steps on this page. Candidates can check the GATE 2018 exam statistics to know the idea about how many candidates appeared in the examination. Total number of candidates had participated in the GATE exam is 7,87,148. They can check the below table to know the more details and can go through the GATE Rank Predictor. Candidates can check the GATE 2018 Result by following the above given instructions on this page or press Official Link, for more updates about the GATE Exam Result you can go through the Official Link. If you have any query related to GATE Rank List 2018 and GATE Results 2018 then you can comment in below section of this page.